Hold the Phone! Most Teens Take Social Media Breaks! Ever try to pry a tablet from sticky fingers? Check out these tips to avoid the tantrum and focus on "QualAuntie Time." It’s hard for many of us to jump out of the digital world, so just imagine you're 3 and the lines between fantasy and reality are already blurred -- then throw in a super-engaging, colorful, fun, immersive experience. Or you're 5 and each episode of Mutt & Stuff on the Nick Jr. app is better than the last. Or you're 8 and you're almost finished building something amazing in Minecraft. Why would you ever want to stop? This is why getting kids off their devices is so tough. And when threatening doesn't work, and you discover the research that two-minute warnings aren't the best option either, what can you do? 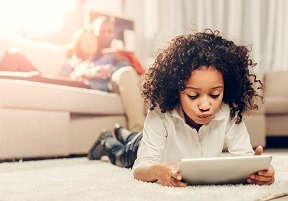 Thankfully, the American Academy of Pediatrics (AAP) has some new guidelines around screen use that ease some guilt of letting them use their devices in the first place, but you still need to get your niece or nephew off the iPad at some point. After all, aunts want “QualAuntie Time” with the kids they love. Aside from being a strong role model, try these tips to minimize conflict and find the balance we're all seeking. Have another activity lined up (bonus points for making it seem fun). For the youngest device users, transitions are hard -- period. Even if the next "to do" is a "must do" (such as eating lunch), tell your niece or nephew what's coming next. You can rehearse the process: "When I say stop, it's time for the iPad to go night-night. Let's see how fast you can flip it shut! As soon as it's asleep, we can sneak into the other room and paint." Find apps with built-in timers. Video streamers like Cakey and Huvi throw parents and caregivers a bone and have internal timers so the app stops on its own. Then it's up to the grownup to make sure the kiddo doesn't just jump into another app. Tell kids to stop at a natural break, such as the end of an episode, level, or activity. It's hard for kids (and adults!) to stop in the middle of something. Before your nieces and nephews get on a device, talk about what they want to do or play, what will be a good place to stop, and how long they think it'll take. Set the limit together and hold to it, though a little wiggle room (a couple of minutes so they can finish) is fine. Have a conversation with their parent(s) about possible consequences, discuss these with your nieces and nephews, and follow through when the kids test the limits. When all else fails, it's important to have discussed consequences for when your niece or nephew won't give it up. For little kids, the line can be something like, "If it's too hard to turn off, the tablet has to go away for a whole day." For older kids it's more about keeping devices in a public space, setting expectations, and enforcing them. If they show you they can be partners in moderating and regulating themselves, there can be more flexibility. Home Expertise 5 Smart Strategies to Get Nieces and Nephews off their Devices!